When the sun comes out and the grass begins to grow, the bowling season cannot be far away. 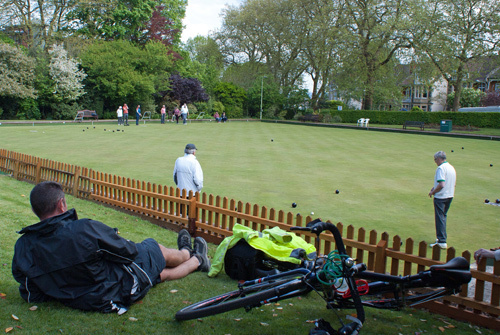 Colin Sara, Vice Chair of Redland Green Bowls Club describes his idea a perfect day on the lawns. MY vision of summer used to be playing in a village cricket match in rural Somerset, but now it is a Sunday afternoon mixed friendly match on the lovingly tended square of smooth green grass of Redland Green Bowling Club. Stood at one end with two team-mates and three opponents we each deliver our two woods and then wait and watch while our skip either wins us the end or wrecks it. There is a little light joshing with or by the ladies and plenty of opportunity to chat or comment on the progress of the game. They say that the result it unimportant, but as the afternoon moves to its end someone will say “We’re just five shots ahead overall”. As we share a drink afterwards, no-one minds who won, but we still applaud when the captain announces the overall result. Even if you lose, it is always nice to win your own rink. As I release the first wood of the season I wonder whether I can still do it. Whether I will persistently leave it short, or overhit. But quickly it all comes back. The season stretches ahead, with the roll-up (practice) on Monday evenings, league matches on Thursday evening, friendlies on Saturday or Sunday afternoon and all the club competitions and ad hoc friendly games. Not enough people are playing bowls. Not enough people are taking any exercise at all. At the end of an afternoon’s bowls, you know you have had some real exercise, but your legs do not ache as they did playing golf or cricket, and there are no football bruises. To enjoy the game you do not need any sporting experience sport; many people take straight to bowls without any previous sport. Contact Mr or Mrs Wickham – 0117 962 4466 or email peterjware@blueyonder.co.uk.